The text is part of the ancient Tantras, although how ancient that is we cannot say exactly. It was handed down through the oral tradition, which means that it was memorized and chanted for dozens or perhaps hundreds of generations. The word tantra has interesting resonances. Its usage here is “the teaching,” and is from the Sanskrit tantram, meaning “loom.” There is the image of stretching threads in patterns across the framework of a loom — a tapestry of knowledge. The Indo-European root of the tan in tantram is ten, to stretch. Thus tantra comes from the same root that gives English the words “attention,” “tender,” “intend,” “entertain,” “intensity,” and “tendon.” Each of these terms is a vital clue to how to practice. To practice tantra is to stretch ourselves, to extend our capacity for attention to the utmost. Tantra is also the pattern of interconnectedness that we discover when we do so. The tra of tantra means “technique.” The same root shows up in mantra (manas=mind, + tra=skill, thus, “a tool of thought”). Each verse of a tantra is called a sutra, (there’s tra again) which means “thread,” and is cognate with the English “suture,” the thread that joins together. So we are presented with images of skillfully weaving together all the elements of life — mind, body, emotions, breath, soul, individuality, and infinity – into one exquisite tapestry. Jnana (sometimes spelled gyan) is knowledge, to know. Vijnana means practical knowledge. In this context vijnana refers to your “knowledge body” – the dimension of your body that is in direct practical contact with the mysteries of the universe. The approach this tantra advocates is simple — a completely undefended looking and feeling into the essential activities of life: joy, sorrow, breathing, loving, walking, dancing, sleeping. Meditation is diving into your entire sensorium so fearlessly that you go beyond it into the core of your being and rest there. This is a yoga of delight, awe, and wonder. Meditation is about taking one thing and going deeper and deeper into it. Ask your body to teach you and to lead you into the realm of these experiences. If you ask, life will lead you, for these are all sensory experiences, and all have to do with how life maintains life. Life renews itself through a symphony of ongoing rhythms. Tantra can be thought of as attending to these rhythms. Breath is a rhythm, and we breathe in and out thousands of times a day. Breathing involves an intimate relationship of this body with the ocean of air within which we suspire. A dozen senses inform us of the rhythm, texture, and qualities in each breath. Life is always inviting us into a deeper relationship with breath, with the pulsing of our hearts and emotions. People who come for instruction in meditation often have one or more of these awareness practices vibrating in their body already, spontaneously. Sutras such as these are there to remind us of what we already know. And they are there to invite us to go more deeply into the experience of being human. It is likely that the same meditation techniques are invented or discovered independently around the world in different cultures, whenever people start paying attention to the subtle energies of the body. 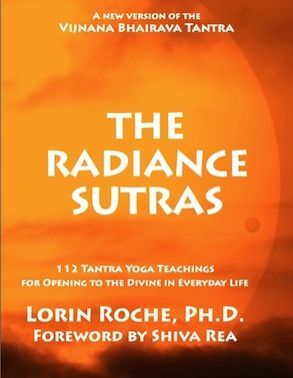 If this is true, then The Radiance Sutras is a syllabus of the types of techniques that could be discovered anywhere. In my experience, they are discovered and rediscovered continually, by regular people and lovers. This a book to savor one phrase at a time, over a period of days or years or a lifetime. Each of the meditations is meant to be experienced many times under many different conditions. The language of the sutras is very brief, meant to be read over and over. Each word is an entire book, and each sutra is a whole lineage to explore. Experiment with reading them out loud to yourself or to another person. The original Sanskrit of the Bhairava Tantra has a mantric quality that massages the nerves like music. Like no other language I have ever heard, Sanskrit is a song of the union of opposites. The opposites embrace each other, as lovers do, as the eternally fascinating polarity of male and female, day and night, sun and moon. Tantric meditation is an integration of the opposites, not obliteration or mere transcendence of them. It is an alchemical union in which each exists in its fullness and in a relationship of complementarity with the other. The first few sutras and one in the middle kept me busy for a year. Your pace may be faster or slower. When you discover one that resonates deeply, my recommendation is to memorize it. Then you will, as they say, know it by heart. Something happens in the body when you can say a sutra out loud or quietly to yourself. There is a relaxation, an ease and confidence when you can rest your attention inside a sutra and the words flow effortlessly. The sutras tend to lay the groundwork for each other, but there is no rule that you have to go through them in sequence. Some of the techniques will speak to you now and others will only have meaning after you have explored for awhile. Another way would be to pick one now, whatever strikes you, and practice it for three months. Give it time to work. Then read the book again and see if it is time to move on or to include another technique in addition to the one that you have been doing. The text says that if you go deeply into even one of these ways of experience, making it your own over time, you will awaken.